Rebecca Beatrice Brooks April 20, 2016 August 11, 2018 9 Comments on What Was the Olive Branch Petition? The Olive Branch Petition was a final attempt by the colonists to avoid going to war with Britain during the American Revolution. It was a document in which the colonists pledged their loyalty to the crown and asserted their rights as British citizens. The Olive Branch Petition was adopted by Congress on July 5, 1775.
Who Wrote the Olive Branch Petition? Thomas Jefferson wrote the first draft of Olive Branch Petition but it was considered too inflammatory. John Dickinson, a delegate from Pennsylvania, wrote the final draft, which was much more toned down. Dickinson is often referred to as the “penman of the Revolution” and had previously represented Pennsylvania in the Stamp Act Congress in 1765 and drafted its declaration of rights and grievances. In 1767-68, he became famous after publishing his Letters from a Farmer in Pennsylvania, to the Inhabitants of the British Colonies, which appeared in many colonial newspapers. The purpose of the Olive Branch Petition was to appease King George III and prevent the conflict between the colonies and the British government from escalating into a full blown war. The reason for the mixed messages was due to the fact that in the summer of 1775, the Continental Congress found themselves divided on the issue of going to war with Britain. One side wanted greater freedom under British rule, similar to what they experienced during the period of Salutary Neglect, while the other side wanted complete independence from Britain. 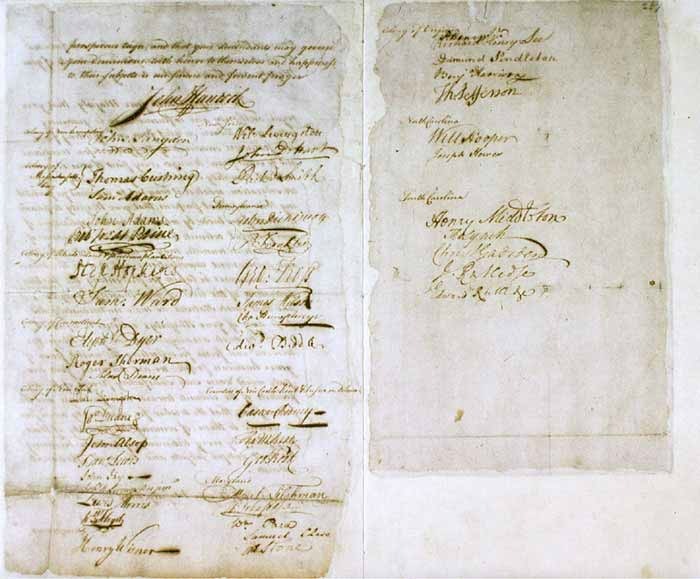 Why Did the Continental Congress Adopt the Olive Branch Petition? This petition was a last ditch effort by the reconciliation party to amend things with the king before war was officially declared, even though the Revolutionary War had already begun in Massachusetts when the Shot Heard Round the World was fired and the Siege of Boston began in April of that year. Furthermore, according to the book Independence: The Struggle to Set America Free, the petition was the result of a compromise, first proposed by John Dickinson in May, between the “moderates” and the “hard liners” in the Continental Congress: if the moderates agreed to the military preparations sought by the hard liners than the hard liners would agree to the Olive Branch Petition. 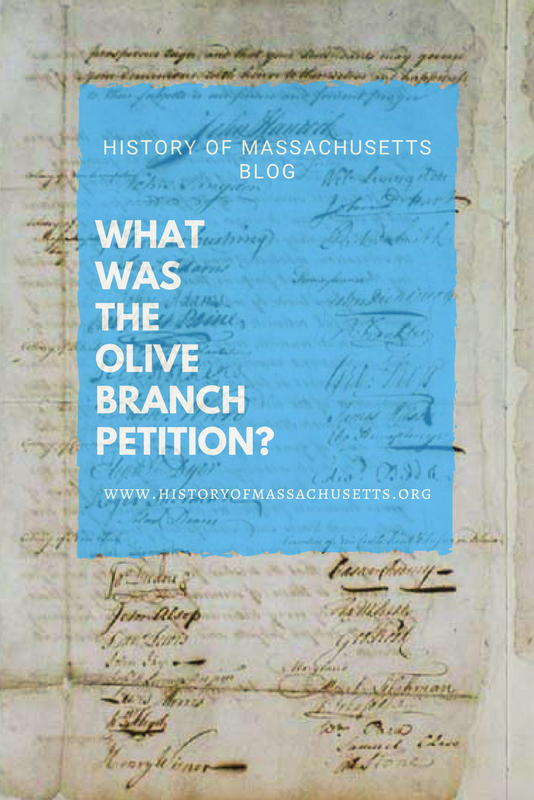 What Were the Terms of the Olive Branch Petition? Two copies of the Olive Branch Petition were created and both were signed by 48 delegates which included John Adams, John Hancock, Roger Sherman, Benjamin Franklin, John Jay and Thomas Jefferson. Was the Olive Branch Petition Successful? Richard Penn and Arthur Lee were sent to England to deliver the petition to the King and arrived in August of 1775. On August 21, 1775, the second copy of the petition was also sent to Lord Dartmouth, the Secretary of State for the colonies. When he later received the original petition from Penn and Lee on September 1, Dartmouth attempted to deliver the petition to King George III but the king refused to read it. Many sources state that a confiscated letter, written by John Adams to James Warren on July 24, 1775, that revealed detailed plans for war while also mentioning the petition undermined the Olive Branch Petition’s success when it was sent to England, arriving on September 17, where it was immediately published in the local newspapers. It is unlikely though that the letter had much of an impact on the king’s decision since he had already issued the Proclamation of Rebellion in August. Although it didn’t influence the king’s decision, its publication officially outed Adams as a leader in the resistance against the British government. The Olive Branch Petition was a significant, yet doomed, attempt to preserve the relationship between the British government and the colonies before the conflict escalated into war. It appears, though, that since the petition arrived months after the Battles of Lexington, Concord and Bunker Hill, it was too late to have any effect on the situation. Historical Dictionary of the British Empire. Edited by James Stuart Olson, Robert Shadle, vol 2, Greenwood Press, 1996. Syfert, Scott. The First American Declaration of Independence? : The Disputed History of the Mecklenburg Declaration of May 20, 1775. McFarland & Company, Inc, 2014. Ferling, John. Independence: The Struggle to Set America Free. Bloomsbury Press, 2011. Adams, John and Samuel Adams and James Warren. Warren-Adams Letters: Being Chiefly a Correspondence Among John Adams, Sameul Adams and James Warren. Vol. 72, Massachusetts Historical Society, 1917. Nellis, Eric Guest. The Long Road to Change: America’s Revolution, 1750-1820. University of Toronto Press, 2007. This a good site! You should trust this site!!!!! I used this article to help me on my american revolution project and I got an A+ on this part. That’s awesome! I’m so happy to hear that! This is really gonna help me out in my SS class! Thanks!